Heat of the Remenham Challege Cup, Princeton University, on Friday, 01/07/2016 at the Henley Royal Regatta. Photo by Peter Spurrier. High school athletes in many sports do not stand a chance of making a college team. It’s a tough reality to grasp, but not everyone can play basketball for Duke or football at Ohio State. But collegiate rowing coaches almost universally say that everyone can row in college—or rather, everyone has the opportunity to do so. Athletes may not earn a coveted recruit spot at a university like Princeton, but if they are admitted to the school, they are often welcome to walk on to the team. It may be difficult initially to reconcile one’s own abilities and accomplishments as a high school rower with the desires of the nation’s elite collegiate crews. The recruiting pool has gotten deeper with each passing generation, making selection to a high-caliber program even more challenging. The high school rower best positioned to row in college is the one who is aware of the opportunities that are out there. Yes, there are the longstanding powerhouses of the Ivy League and the Pacific Northwest. But the collection of collegiate rowing programs in the United States is so much richer. Just look at Hobart College. 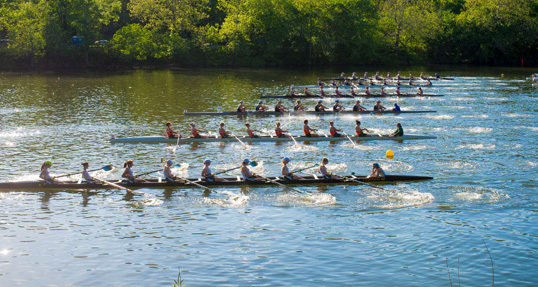 The Division III liberal arts school in Geneva, New York, has emerged as a Top 20 IRA program that even sends crews to English Henley. The University of Virginia boasts one of the nation’s best club programs—alongside powerhouses like the University of Michigan, Grand Valley State University, and the University of Delaware. The slogan “club in name only” rings ever more true when these crews hit the water. Even on the women’s side, the University of Texas at Austin is blossoming as a premier rowing destination since former Cal coach Dave O’Neill took the reigns, and Ohio State University has quickly become a crew powerhouse. That’s to go along with 142 other NCAA-sanctioned women’s rowing programs across three divisions. So collegiate rowing is available to every interested and willing high school rower out there. Rowers of all stripes can set themselves up for success wherever they choose to row by understanding the rowing landscape, getting into the system, and avoiding the mistakes that can hamper their chances. It’s really like a first job interview, and with that in mind, it must be taken seriously. Students applying to colleges ask important questions as they seek out admission. Are the majors I’m interested in available? Do I fit into the campus and student body? Do my resume and test scores make me a viable candidate for admission? Can I afford it? These questions all remain applicable for the high school rower. After all, the diploma at the end of college is often the more practical takeaway in the eventual job search than a collection of medals. That said, a serious recruit understands that collegiate rowing is often as demanding as the pursuit of an academic degree. So answering those questions is important in first identifying schools where rowing could be a possibility. Concurrently, rowers should consider what kind of collegiate rowing experience they desire. And with the line increasingly blurred between what differentiates club and varsity teams, that calculus is becoming more difficult. One difference that persists is the national championship race for a given team. On the men’s side, Ivy League crews, as well as larger varsity programs—from Washington to Wisconsin—race at the IRA. But so do programs like the DIII Hobart, which annually strives to take its entire team to the IRA, and a handful of varsity teams at other schools that will send a crew or two each year. Then there are schools for whom the Dad Vail Regatta or ACRAs serves as the cap to the racing season. These include smaller varsity programs, as well as club teams, which are not permitted to race at IRAs. Don’t mistake these regattas as second-rate, though—the racing is fast and the competition is deep. By that, Biller means that even club rowers can go on to compete for the U.S. national team and race in the Olympics. Matt Miller, a 2011 Virginia grad, rowed in the men’s four in the Rio Olympics in 2016. For the many women’s varsity programs across the country, racing for an NCAA championship is the dream. Yet it’s not the only way to a title. Lightweight women’s events are held at the IRA, not NCAAs. And many club programs contend for championships at the Dad Vail or ACRAs as well. These differences in championship races do not suggest that crews of a certain category train less hard or desire success any less than crews of another. Instead, they are probably better indicators of how challenging it can be on a team to earn a seat in the first boats. The more highly sought-after IRA and NCAA Division I programs often boast the biggest depth charts. That makes earning a varsity eight spot much harder. And yet, at so many other competitive programs, those spots may be easier to reach. “Sometimes it’s better off having a great experience at the minors than to play in the majors,” he adds. For many high school rowers, getting admitted to an elite institution—let alone being recruited—will be their biggest challenge. Finding alternative terrific options, however, should not be. After rowers have an idea of which schools they are interested in, the application and the visit are two big next steps. Both of these have a corresponding rowing component, as well as follow-up communication with a coach. Virtually every team has a recruiting questionnaire on their website, and that is often how a rower enters a team’s pool of candidates. Erg scores, boat assignments, and racing achievements are all part of this application. Success matters. Athletes whose boats win, especially in big races, are attractive to coaches. Standards keep rising, too. The 2k score that might have garnered a look from coaches five years ago may now fall a bit short. On the women’s side, O’Neill says that breaking the seven-minute barrier used to be “amazing.” As more have achieved the feat, “that’s not so amazing anymore.” However, he adds, “I think the cornerstone of our program will continue to be kids developing,” so the erg is not the be-all and end-all for recruiting. Once a rower is in a team’s system, the conversation begins. However, the NCAA dictates some restrictions. Before their senior year, high school athletes can only meet a coach on campus; however, coaches can respond to emails and phone calls from juniors. An unofficial on-campus visit provides a good introduction to the program, and even can help rowers learn more about the culture of the team. Across the board, coaches say the pairing of a rower and program comes down to fit. That’s an important distinction to make between someone who is a recruit, versus just an interested athlete. Coaches will actively recruit students who fit with their program and will help make it better. To that end, rowers should provide updates to coaches of their progress: a new PR, a victory at a significant race, a selection for an under-19 boat. Generally speaking, programs try to respond to these emails, but coaches will sometimes focus their time on the athletes they’re most interested in. At first that sounds discouraging, but it doesn’t mean that rowers can’t be on the team at the schools they are admitted to. For club programs, usually there’s little sway that the team can have on an admissions decision, especially at selective schools like Michigan or Virginia. Biller says sometimes he will have candidates for whom he might send a letter of recommendation, but he is limited in how he might help an applicant’s chances. Lightweight rowers have an interesting place in the recruiting pool. If they are too small, programs will likely pass. If they’re too big, they may get a look from the heavyweight team, but lightweight coaches probably won’t sign a rower who would enroll already above the weight limit. On top of the email or phone call updates, rowers might also help make their case to a school by sending videos of themselves rowing—port, starboard, and sculling. If they have enough skill, it could work in their favor. But again it is just one variable in the equation. Ultimately, rowers have to present their best case to the team. While many teams may desire their erg scores or race performances, it’s the coaches who make decisions, and so it’s the coaches who must be convinced of the fit within the entirety of their program. It’s surprising to ask coaches about the biggest mistakes potential recruits make. Each one has a story. “We certainly ask the kids on our team, ‘Will she be a good teammate?’ and that’s important. That goes a long way,” he says of rowers who visit the team. College coaches will contact the junior rower’s coach and ask about how a recruit is as a teammate. 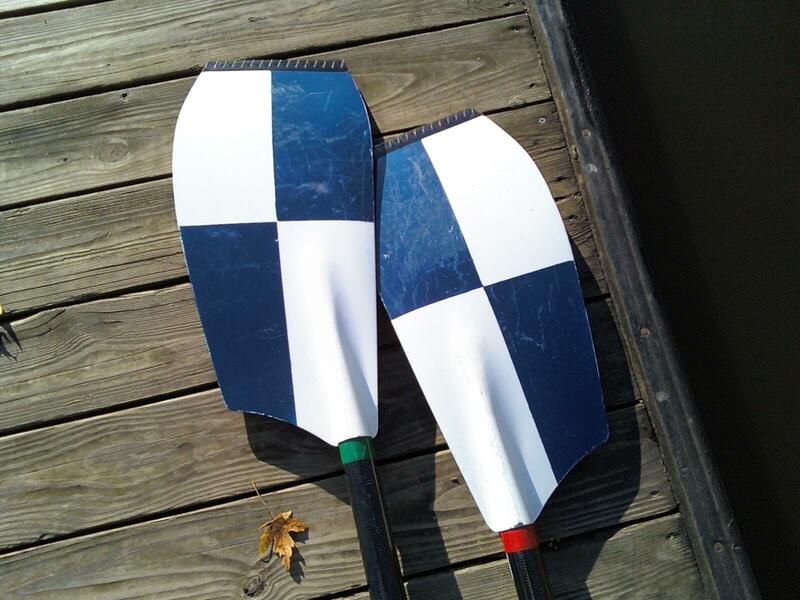 A talented rower who is toxic on a team may struggle to hold a college coach’s attention. Even with social media, high school rowers can hurt their chances with posts that show them behaving negatively or that contain derogatory comments. Being recruited, therefore, is an interview that lasts beyond the on-campus visit, and coaches take behavior very seriously. Athletes who fall silent will see their stock fall, as well. The scholarship conversation, of course, will come into play at universities where athletic offers are an option. However, it’s part of the larger conversation about whether the rower, team, and school are a good match. Although rowing scholarship opportunities are more numerous for women than men, O’Neill cautions that misinformation has skewed the perception of how easy they are to obtain. It’s still very challenging. Eventually the day arrives when admissions committees mail out decisions, and rowers are left to consider the two years’ worth of information and experience that the college search process yields. Finances, majors, campus life, and future job placement will be a huge part of that discussion. Rowing coaches hope that college racing is, too. The search for the right collegiate rowing team can run for about two years. College racing itself will only go twice as long as that. But make a good, informed decision, and the benefits of that experience will last a lifetime.